Whack-A-Mole is very traditional action game. 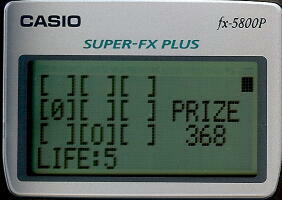 fx-5800P is much slower with very limited Casio Basic than fx-9860G II and fx-cf10. So I wanted to know if the action game run on slow fx-5800P by means of CASIO Basic. 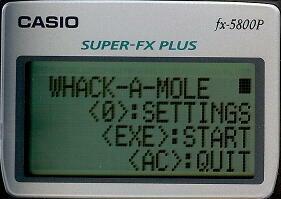 The main routine is "WHACK-A-MOLE" and it calls "WAM". Game title and menu, you can change game settings. EXE to move to game main. 0 to start the game. Mole (letter O) appears, and press 1 to 9 key to hit the mole. If you are slow, you will lose LIFE. If you are very slow, you will lose LIFE and PRIZE. in a mean while (when PRIZE is getting to more than 200 as default), a fake mole (0, zero) appears. If you hit the fake you will lose LIFE. Sometime fake mole and real mole comes at the same time. Unless you hit only the real mole, you will lose LIFE. When LIFE is 0 (zero), game is over. Probably the speed of the mole action is fast enough. Locate 1,I,"[ ][ ][ ]"
Edited by Krtyski, 01 January 2014 - 02:03 PM. 1. Your are a Mole Buster. 2. You get 7 LIFEs when you start the game (this can be changed at settings). 3. You get FUND each time you engage a mole, the default FUND is 20 . 4. You spend cost to kill each mole, the longer you kill the more cost you spend. The cost is increasing after the mole appears until the mole is killed. 6. You have to kill the mole within LIMIT which is Cost=17 as default. The LIMIT (BURST LIMIT) can be changed. Unless you kill the mole within the LIMIT, you lose one LIFE. The LIMIT can be changed. 7. Mole shakes when you spend Cost=25 (Time-out) as default, then you lose one LIFE and 25 PRIZEs. 8. When your PRIZE gets 200 (default) at first time, fake mode is invoked. The default can be changed. 9. There are 2 fake modes; one fake mole appears and one fake and one real mole appear at the same time. 10. When you kill the fake mole, you lose one LIFE. You have to leave the fake mole goes back. 11. 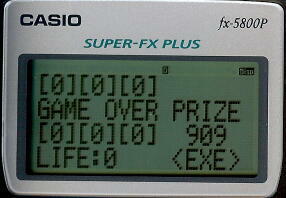 When your LIFE gets 0 (zero), the game is over. The Cost is running by a loop timer (Do loop) and this timer controls the game, very simple. Edited by Krtyski, 07 January 2014 - 04:33 AM. This looks so nice... Well done! Thanks, did you enjoy it. 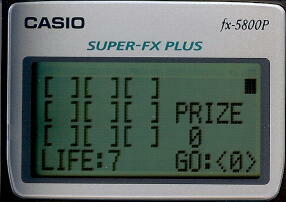 I just wanted to rate performance of fx-5800P, and realized Casio Basic is so nice! 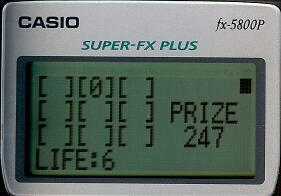 CASIO fx-5800P, still going strong!